Michael Singer Studio was selected as a part of an integrated design team to lead the re-imagining and design of the new West Palm Beach Downtown Waterfront. The Waterfront is over a 1/2 mile long and encompasses over 12.5 acres along the Intracoastal Waterway. The new civic space revitalizes the City’s historic downtown and restores the natural beauty of West Palm Beach’s waterfront. The Studio designed the main commons and event spaces, 3 new floating docks, shaded gardens, two community buildings, a continuous waterfront esplanade, shade trellises, custom benches, 7 water elements and an estuarine ecological regeneration area known as the South Cove. The $30 million park (with $9 million of that coming from Federal, State and Local grants) opened in early 2010, with an estimated 80,000 people attending the grand opening celebration. The design relocated the Public Library from the base of Clematis Street, opening waterfront views and views of Palm Beach Island, and access to a large public commons green space. Shaded garden pathways along both North and South Clematis Streets have several unique sculptural water gardens. The main central space of the commons was designed to accommodate major downtown events such as the Palm Beach Boat Show, Sunfest and the 4th on Flagler. The Landing and Beach areas result from repositioning Flagler Drive west to gain more public access to the water’s edge. The Beach area consists of recycled concrete fines paving, mature coconut palms and pockets of seating nestled into swathes of native vegetation. The Esplanade consists of several discreet spaces including intimate seating areas and small ‘rooms’ along a continuous bike and pedestrian path. Existing trees were saved and some were transplanted from the old library site to create a more varied and mature shade canopy along the Beach and Esplanade. 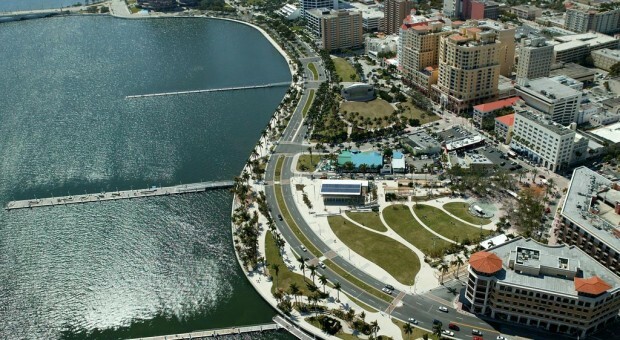 For additional information on the West Palm Beach Waterfront project click here. For additional information on the West Palm Beach Waterfront project environmental design elements click here.